Do you ask yourself this question…’Am I a mad scientist*?’ when your project has doubled in cost, the feature set is stripped beyond recognition, and it no longer meets original customer requirements since they’ve changed numerous times during the project? And to top it all off, you’re experimenting and trying to solve an important problem just before this Franken-product is ready to launch? 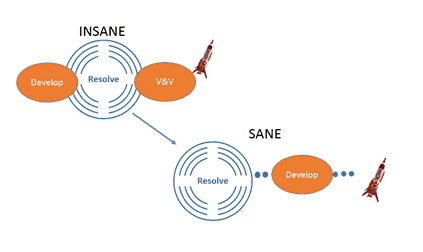 Rest assured, you are quite sane, but the process you’re following is probably insane. The process is insane because the biggest project uncertainties have not been solved early in the process, so they arise as unexpected problems during development and V&V. This includes all types of projects risks, not only technology, but commercial, regulatory and operational risks, etc. Solving all those important project unknowns later in the process can lead to increased project cost, wasted resources and a product the customer couldn’t care less about. Want to avoid this last-minute problem-solving? We highly recommend resolving all the biggest project uncertainties early in the process. As these uncertainties are resolved, then it is time to determine if you want to continue with the project or if you want to kill it. We realize that it is impossible to resolve all risks, but it is important to intentionally recognize it and handle it, if you wish to proceed with the project. Preston Smith believes risks can be an ally[i]. He drives home the point that innovative product development is dependent upon exploring product unknowns and uncertainties in order to add product value and a competitive advantage. But don’t confuse risk-taking in the form of daring new ideas with risk-taking rising from inadequate handling of uncertainties. Be a sane scientist, not a mad scientist. If your process is driving you insane and you know that you’re not a mad scientist, think about doing product development differently with driving down the biggest project uncertainties first. Read the white paper on our new approach, called Exploratory PD (ExPD). It is based on the premise of reducing risks and uncertainty. *Reference to ‘scientist’ in this blog, refers to anyone within product development that resolves problems. This can include the resolution of technology, commercial, regulatory, operational problems. [i] Preston G. Smith and Guy M. Merritt, Proactive Risks Management: Controlling Uncertainty in Product Development (Productivity Press, New York, 2002).